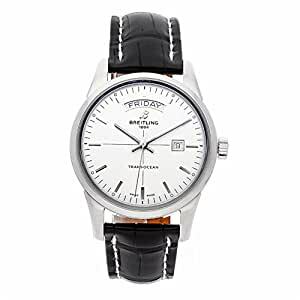 Pre-Owned Breitling Transocean Day & Date (A4531012G751) self-winding automatic watch, features a 43mm stainless steel case surrounding a silver dial on a brand new black crocodile strap with a stainless steel deployant buckle. Functions include hours, minutes, seconds, day and date.Â This watch comes complete with box and papers. Majority of time remaining on the factory warranty!. Buy with confidence knowing each timepiece goes through the same rigorous 31-point inspection. Rest assured only authentic parts straight from the manufacturer are used. The Certified Pre-Owned Program on Amazon ensures peace of mind and transparency via standardized reports and a 1 Year Warranty Provided by WatchFacts.